This installation method works in Photoshop CC, CS, & in Elements 11 & Up using the Actions Player. After downloading your Actions, be sure to extract the Zip file they came in and save them to a safe place on your computer. 2. At the top of your screen, navigate to Window>Actions. This should make the Actions Panel pop out. 3. 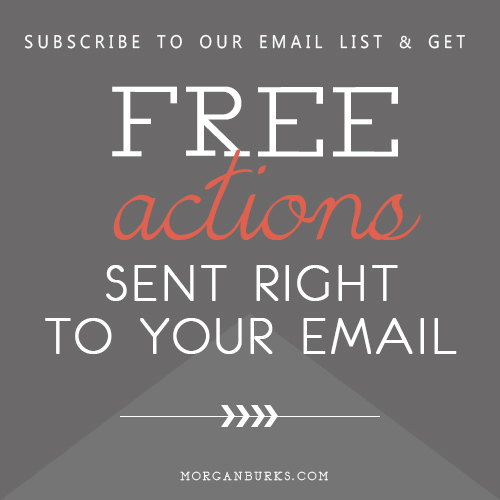 Click on the little button in the top right corner of the Actions Panel (the button with the downward pointing arrow and four horizontal lines). When the flyout menu pops out, find and select “Load Actions” from the list. 4. A window will open that allows you to navigate and find the ATN file you wish to install. 5. When you find the ATN file, highlight it and hit ‘Load’. 7. Once the individual actions pop up below, all you have to do is highlight the one you want to use and hit the triangular ‘Play’ button at the bottom of the Actions Panel. 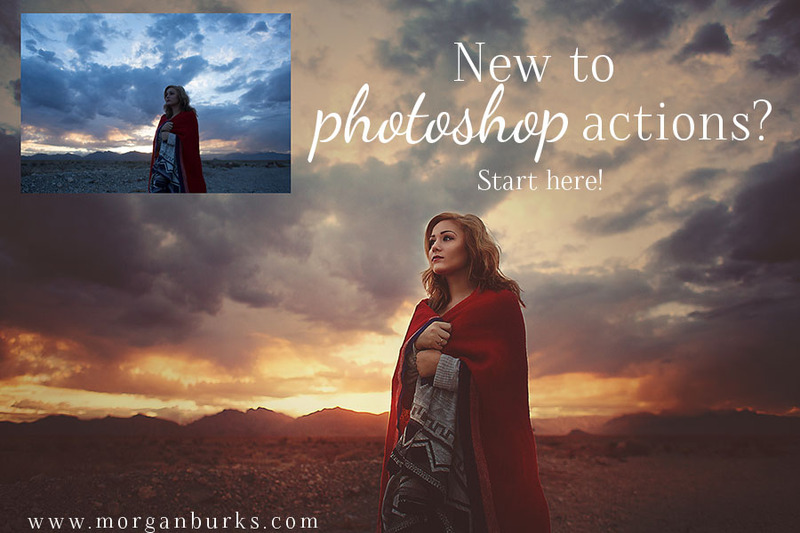 Visual learners, you can watch the video tutorial for installing Photoshop Actions here. Installing actions in Elements 10 and below can be kind of tricky, click here for a walk-through video tutorial. 1. In Photoshop, select Window > Brushes. 3. From the list, select “Import Brushes”. 4. Navigate to the location you saved the Brushes you wish to install, select them, and then choose “Open”. Your new brushes should now be located at the bottom of the Brush Panel. Scroll down to select one and give it a try. For alternate written instructions and a photo visual, click here. For a video tutorial on installing and using Photoshop Brushes, click here. Before applying Sky Overlays in Photoshop, be sure to ‘Extract’ the zip file they come in. 2. Navigate to the Overlay you would like to apply and click ‘Place’. 3. The Sky Overlay should now appear on your image. Stretch it to fit your photo as needed and then hit Enter to accept the changes. 5. Next, place the Sky in ‘Multiply’ blend mode. 6. Select the Layer Mask on your Sky layer, and use a soft black brush to remove the sky effect from any areas you don’t want it to apply. 7. If needed, you can finish up by adjusting the opacity of the sky to soften the look. 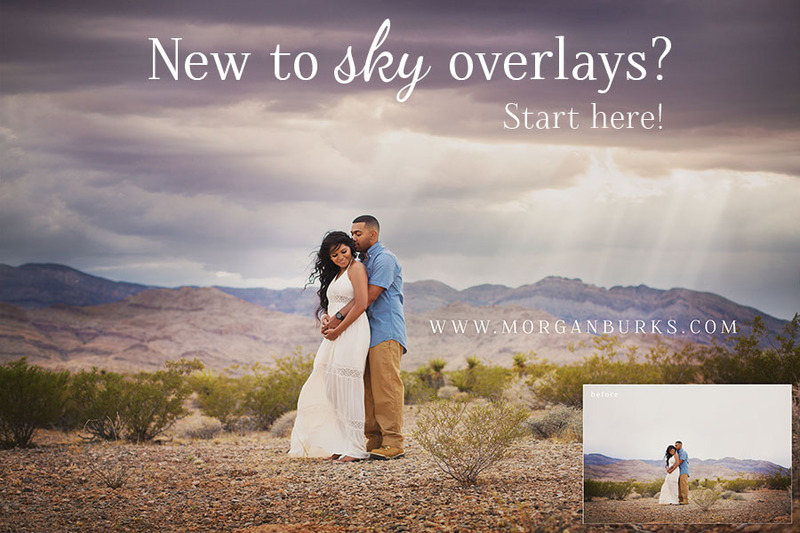 If you’re a visual learner, you can check out the Sky Overlay Video Tutorials to see this process in action. Before applying Overlays and Textures, be sure to extract the Zip file they came in. If your file isn’t zipped, then you’re all set! 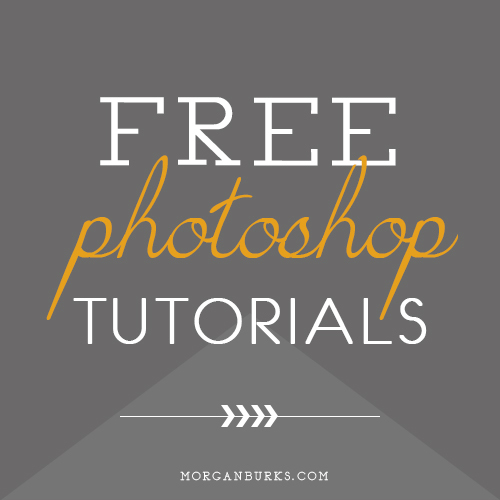 There are two different methods you can use to apply overlays & textures in Photoshop. I will describe both below. The first method is a slightly longer method, but saves you time in the long run if you wish to use the overlay/texture on more than one image. The second method is a quicker method that applies the overlay/texture directly to the image you are editing. This method is great if you only have to apply the overlay to one image, but will take more time in the long run if you have more than one image to apply the overlay to. 1. Open the Overlay or Texture like you would open a regular photo, by going to File>Open. 2. Navigate to the folder you saved your products in and double click the overlay you would like to use and it should open into Photoshop. 3. Once the Overlay or Texture opens in Photoshop, grab your move tool and drag and drop the overlay onto the image you are editing. 5. You can then change the blend mode for different effects, or adjust the opacity to your liking. 6. If you wish to remove the effect of the Overlay or Texture from any area of your image, you can use a layer masks and paint with a black brush to remove or soften the look of the overlay or texture from any area it is too strong. 1. To place the overlay directly onto the image you are editing go to File>Place to navigate to the folder you saved your products in. Double click the overlay you would like to use, and it opens directly onto your image. 3. You can then change the blend mode for different effects, or adjust the opacity to your liking. your image, you can use a layer masks and paint with a black brush to remove or soften the look of the overlay or texture from any area it is too strong. 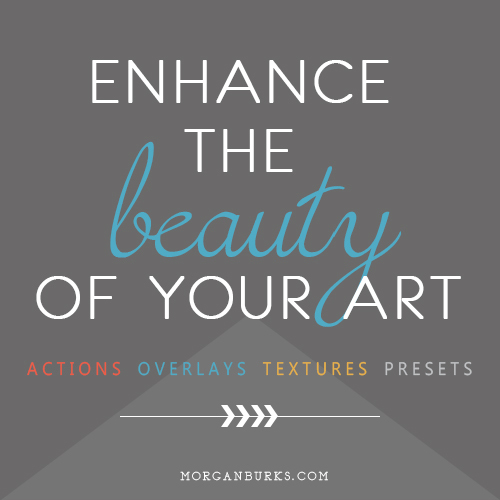 Visual learners, you can watch a video on Applying Textures & Overlays here. Before installing your presets, be sure to extract the Zip file your products came in. If the file isn’t zipped, then you’re all set! 1. Launch Lightroom and click the ‘Develop’ tab at the top of your screen. 2. From the list, select ‘New Preset Folder’ and type the name of the product you are installing. 3. The new folder will appear in the ‘Presets’ box on the left side of your screen. Right-click on your new folder and hit ‘Import’. 4. Navigate to where you saved the preset files you downloaded, select them and click Import. 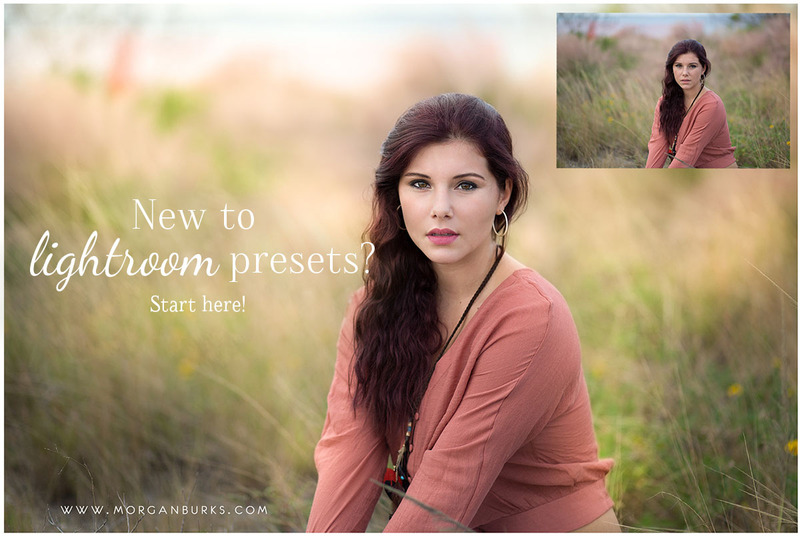 The presets will now be added to your Lightroom Preset folder. Before installing your Adjustment Brushes, be sure to extract the Zip file your products came in. If the file isn’t zipped, then you’re all set! 2. When the Preferences box pops up, select the ‘Presets’ tab at the top. 3. Click the ‘Show Lightroom Presets’ button. 4. Double click the ‘Lightroom’ folder to open it. 5. Then Double click the ‘Local Adjustment Presets’ folder. 6. Copy and your paste your MB Lightroom brushes into the ‘Local Adjustment Presets’ folder. The brushes will now be added to Lightroom. Close and restart Lightroom to begin using them! Visual learners, you can watch a video tutorial on Installing and Using Lightroom Presets and Brushes here.